The calm before the storm: Craig Johnson (center), Miriam Schwartz (rear-left), and Peter Christian Hansen (background-right) in Gremlin Theatre’s production of The Father. Photo by Alyssa Kristine. 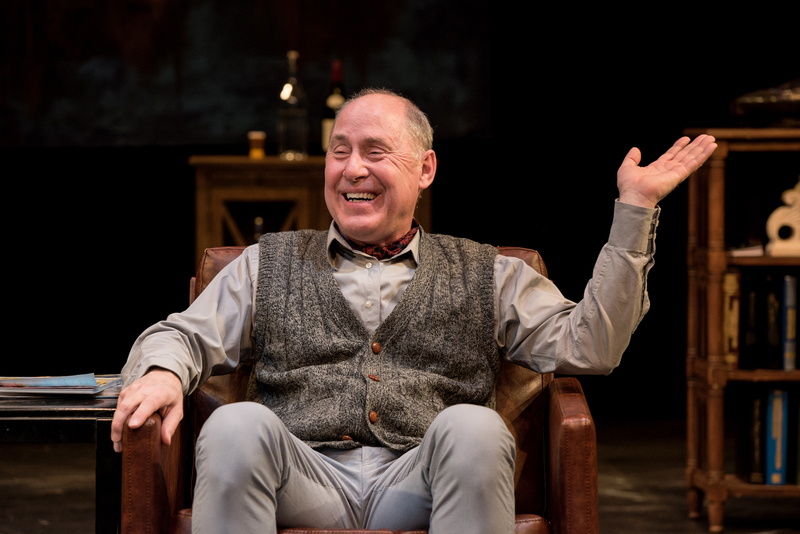 The Father, now playing at Gremlin Theatre, is an engrossing play about a man in his sixties suffering from dementia and his daughter’s efforts to cope with his increasing need for care and supervision. Written by Forian Zeller and adapted by Christopher Hampton, the play emphasizes the surreal world of a person with dementia. Craig Johnson, as the titular Father, gives a dynamic portrayal of a man’s futile grappling with a deteriorating hold on reality. Hampton’s script cleverly unfolds the father’s story while presenting scenes that are obviously out of sequence or re-cast with alternative characters. This surrealism is a symptom of his loss of awareness and his mind filling in the blanks with images from memory. Ultimately, even access to those memories is denied him. At this point, director Ellen Fenster deftly renders the iconic image of an old man in nightclothes standing in harsh light in front of a rickety bed in the center of a bare stage. The character could be from a play by Samuel Beckett, asking the existential question: What defines our existence if we cannot perceive any reliable touchstone to reality? 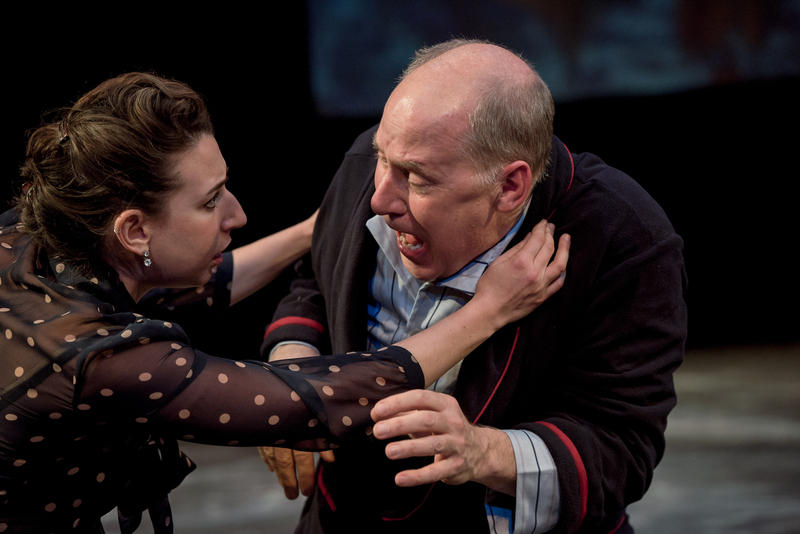 Anne (Miriam Schwartz) tries to calm her frightened father (Craig Johnson). Photo by Alyssa Kristine. Johnson’s performance of the father doesn’t linger on these abstract questions. Instead, Johnson fills the stage with a dramatic presence that expresses the horrible pain experienced by a person caught in the depths of this deteriorating mind. The audience begins to understand the Father’s mental deficit when he cannot find his watch for the umpteenth time. We see the blood rush to his face when he gets angry and yells at his daughter. When he is abused by a caregiver, we feel his sudden shock of helplessness. We also feel the depth of his sorrow when he weeps in the arms of a stranger – who, we realize, is actually a caregiver he no longer recognizes. Miriam Schwartz is precise and articulate in her portrayal of Anne, the Father’s daughter, coping with an increasingly difficult situation. Though her father sees an absurdist world of disjointed time and disconnected action, his daughter’s motivations are shown as both heartfelt and rational. She becomes the reference point to which the audience turns to understand what is really going on. Craig Johnson as The Father in a more lucid moment. Photo by Alyssa Kristine. The lighting design by Carl Schoenborn is simple, direct, and drops off into shadows at the stage edge. Together with Schoenborn’s minimalistic set design, the production gives the impression of a playing space floating amid uncertainty. The physical space becomes increasingly empty, with set items disappearing during the scene transitions. The Father is particularly insightful in its use of absurdism, surrealism and minimalism to provoke in the audience a sense of non-reality similar to that of a dementia patient. We can all the more relate to the father who can’t understand how he fell out of the universe. The Father plays through Jan. 27, 2019 at Gremlin Theatre in St. Paul, MN.